What Is Cite This For Me's Citation Generator? Cite This For Me's open-access generator is an automated citation machine that turns any of your sources into citations in just a click. Using a citation generator helps students to integrate referencing into their research and writing routine; turning a time-consuming ordeal into a simple task. A citation machine is essentially a works cited generator that accesses information from across the web, drawing the relevant information into a fully-formatted bibliography that clearly presents all of the sources that have contributed to your work. If you don’t know how to cite correctly, or have a fast-approaching deadline, Cite This For Me's accurate and intuitive citation machine will lend you the confidence to realise your full academic potential. In order to get a grade that reflects all your hard work, your citations must be accurate and complete. Using a citation maker to create your references not only saves you time but also ensures that you don’t lose valuable marks on your assignment. Not sure how to format your citations, what citations are, or just want to find out more about Cite This For Me's citation machine? This guide outlines everything you need to know to equip yourself with the know-how and confidence to research and cite a wide range of diverse sources in your work. Simply put, referencing is the citing of sources used in essays, articles, research, conferences etc. When another source contributes to your work, you have to give the original owner the appropriate credit. After all, you wouldn’t steal someone else’s possessions so why would you steal their ideas? Any factual material or ideas you take from another source must be acknowledged in a reference, unless it is common knowledge (e.g. President Kennedy was killed in 1963). Failing to credit all of your sources, even when you’ve paraphrased or completely reworded the information, is plagiarism. Plagiarizing will result in disciplinary action, which can range from losing precious points on your assignment to expulsion from your university. What’s more, attributing your research infuses credibility and authority into your work, both by supporting your own ideas and by demonstrating the breadth of your research. For many students, crediting sources can be a confusing and tedious process, but it’s a surefire way to improve the quality of your work so it’s essential to get it right. Luckily for you, using Cite This For Me's citation machine makes creating accurate references easier than ever, leaving more time for you to excel in your studies. To validate the statements and conclusions in your work by providing directions to other sound sources that support and verify them. To help your readers locate, read and check your sources, as well as establishing their contribution to your work. To give credit to the original author and hence avoid committing intellectual property theft (known as ‘plagiarism’ in academia). How Do I Cite My Sources With The Cite This For Me's Citation Machine? Cite This For Me's citation generator is the most accurate citation machine available, so whether you’re not sure how to format in-text citations or are looking for a foolproof solution to automate a fully-formatted works cited list, this citation machine will solve all of your referencing needs. Referencing your source material doesn’t just prevent you from losing valuable marks for plagiarism, it also provides all of the information to help your reader find for themselves the book, article, or other item you are citing. The accessible interface of this citation builder makes it easy for you to identify the source you have used - simply enter its unique identifier into the citation machine search bar. If this information is not available you can search for the title or author instead, and then select from the search results that appear below the citation generator. The good news is that by using tools such as Cite This For Me, which help you work smarter, you don’t need to limit your research to sources that are traditional to cite. In fact, there are no limits to what you can reference, whether it be a YouTube video, website or a tweet. Select from APA, MLA, Chicago, ASA, IEEE and AMA * styles. Choose the type of source you would like to cite (e.g. website, book, journal, video). Enter the URL, DOI, ISBN, title, or other unique source information into the citation generator to find your source. Click the ‘Cite’ button on the citation machine. Copy your new reference from the citation generator into your bibliography or works cited list. Repeat for each source that has contributed to your work. *If you require another referencing style for your paper, essay or other academic work, you can select from over 7,500 styles. Once you have created your Cite This For Me account you will be able to use the citation machine to generate multiple references and save them into a project. Use the highly-rated iOS or Android apps to create references in a flash with your smartphone camera, export your complete bibliography in one go, and much more. What Will The Citation Machine Create For Me? Cite This For Me's citation maker will generate your reference in two parts; an in-text citation and a full reference to be copied straight into your work. The citation machine will auto-generate the correct formatting for your works cited list or bibliography depending on your chosen style. For instance, if you select a parenthetical style on the citation machine it will generate an in-text citation in parentheses, along with a full reference to slot into your bibliography. Likewise, if the citation generator is set to a footnote style then it will create a fully-formatted reference for your reference page and bibliography, as well as a corresponding footnote to insert at the bottom of the page containing the relevant source. Alternative format: Anderson (2006) defined a nation as an imagined community. *The citation machine will create your references in the first style, but this should be edited if the author’s name already appears in the text. A citation style is a set of rules that you, as an academic writer, must follow to ensure the quality and relevance of your work. There are thousands of styles that are used in different academic institutions around the world, but in the US the most common are APA, MLA and Chicago. The style you need to use will depend on the preference of your professor, discipline or academic institution - so if you’re unsure which style you should be using, consult your department and follow their guidelines exactly, as this is what you’ll be evaluated on when it comes to grading. Referencing isn’t just there to guard against plagiarism - presenting your research in a clear and consistent way eases the reader’s comprehension. Each style has a different set of rules for both page formatting and referencing. Be sure to adhere to formatting rules such as font type, font size and line spacing to ensure that your work is easily legible. Furthermore, if your work is published as part of an anthology or collected works, each entry will need to be presented in the same style to maintain uniformity throughout. It is important to make sure that you don’t jump from one style to another, so follow the rules carefully to ensure your reference page and bibliography are both accurate and complete. If you need a hand with your referencing then why not try Cite This For Me's citation builder? It’s the quickest and easiest way to reference any source, in any style. The citation generator above will create your references in MLA format style as standard, but this powerful citation machine can generate fully-formatted references in thousands of the widely used global college styles - including individual university variations of each style. So, whether your subject requires you to use the APA citation, or your professor has asked you to adopt the Chicago style citation so that your work includes numbered footnotes, we’re sure to have the style you need. Cite This For Me also offers a citation machine and helpful formatting guide for styles such as ASA, IEEE or AMA. To access all of them, simply create your free account and search for your specific style. How Do I Format A Works Cited List Or Bibliography? Drawing on a wide range of sources greatly enhances the quality of your work, and reading above and beyond your recommended reading list - and then using these sources to support your own thesis - is an excellent way to impress your reader. A clearly presented works cited list or bibliography demonstrates the lengths you have gone to in researching your chosen topic. Typically, a works cited list starts on a new page at the end of the main body of text and includes a complete list of the sources you have actually cited in your paper. This list should contain all the information needed for the reader to locate the original source of the information, quote or statistic that directly contributed to your work. On the other hand, a bibliography is a comprehensive list of all the material you may have consulted throughout your research and writing process. Both provide the necessary information for readers to retrieve and check the sources cited in your work. Each style’s guidelines will define the terminology of ‘works cited’ and ‘bibliography’, as well as providing formatting guidelines for font, line spacing and page indentations. In addition, it will instruct you on how to order your works cited list or bibliography - this will usually be either alphabetical or chronological (meaning the order that these sources appear in your work). Before submitting your work, be sure to check that you have formatted your whole paper - including your reference page and bibliography - according to your style’s formatting guidelines. 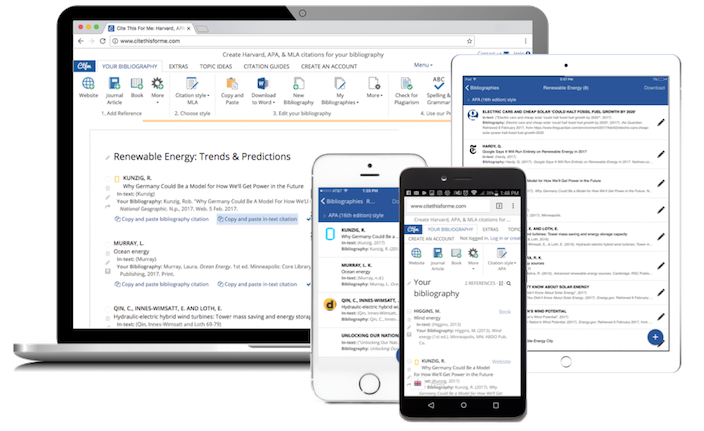 citation machine will automatically generate fully-formatted references for your works cited page or bibliography in your chosen style. Sign in to your Cite This For Me account to save and export your bibliography straight into Microsoft Word, Evernote, EndNote and more. If that sounds like too much work. How Do Citations Actually Work? Although the citation generator will create your bibliography and works cited list for you in record time, it is still useful to understand how this system works behind the scenes. Understanding how a citation machine actually generates references will greatly increase the quality of your work. As well as saving you time with its citation maker, Cite This For Me provides the learning resources to help you fully understand the citing process and the benefits of adopting great referencing standards. Find a book, journal, website or other source that will contribute to your work. Save the quote, image, data or other information that you will use in your work. Save the source information that enables you to find it again (i.e. URL, ISBN, DOI etc.). Format the source information into a reference. Copy and paste the reference into the body of the text. Repeat for each source that contributes to your work. Export or copy and paste the fully-formatted reference into your bibliography.